I hate cables. I’m not particularly crazy about aesthetics — my bedroom floor is currently covered with a nice, healthy layer of clothing and detritus — but when it comes to the charging cables of the various gadgets I own, I inevitably find myself deeply irritated by their rubbery, Medusa-esque tangles. Imagine my delight, then, when Mophie announced Charge Force, its latest line of battery cases and accessories. “Place your Mophie case with charge force wireless power on any wireless charging base and power is sent to your device directly on contact. Never fuss with cables again,” the company promises. I’m a regular Mophie user — I own and use the company’s standard juice pack for extending my battery life — but that case needs to be plugged in to charge. 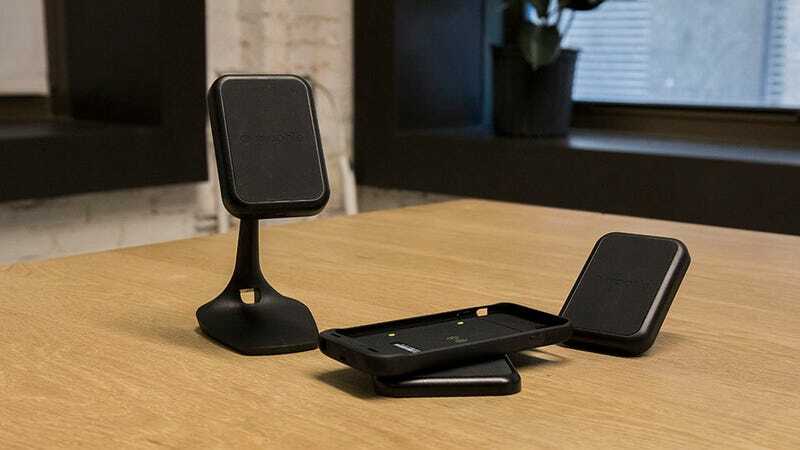 Charge Force pads, on the other hand, wirelessly charge your device and case (in that order) while you’re working, hanging out at home, or driving. Left to right: The desk mount, the charging base, and the vent mount. The theoretical perk, of course, is that while the charge pad is connected via cable to a power source, the actual device isn’t, so it’s easier to pick up and put back. Plus, when the power source can remain in one place, the cords are much easier to place out of sight from disapproving gazes. During my tests, the charging capacities of the pads were a little wonky compared to charging directly via USB and battery pack. I tried them out using two different charging cubes — the one that comes with the Mophie charging pad, as well as the one I use for my iPhone — on a few different outlets. While the charging base consistently charged as quickly as the wired method, the desk mount did not. During one trial, it took 25 minutes to charge up to 21 per cent from nothing. (It took 18 minutes during another trial.) The charging base and the direct through USB/battery pack route both took 19 minutes to charge each time. One rather large drawback in the design is that it doesn't have pass-through Lighting connection capability, so when the case is on you can't plug in a Lighting cable to sync media; you instead have to take the case off to do that. The same goes for the jack port access: want to connect your phone to a speaker while it wears the case? Nope, take it off – the jack port is blocked by the Mophie case. Given the slightly weird performance of the desk mount — as well as the distraction of having my phone stare me directly in the face while I was working — I wasn’t a huge fan, and I wouldn’t purchase it in addition to the bundle. I can stomach shelling out £90 for the bundle but the cost of the extra stands is excessive. It’s even more expensive if you’re a Samsung Galaxy S7 or S7 Edge user: the regular £90 juice pack includes wireless charging, but you’ll still have to fork over £35 for the charge pad by itself. Still, the wireless charging capabilities worked well overall, and it sure was nice not to deal with creeping wires. Plus, “Mophie” rhymes with “Sophie”. What, you really thought I was going to get through this entire review without pointing that out?